Touch interface along with 10 smart keys for 16 functions make the operation easier and faster. 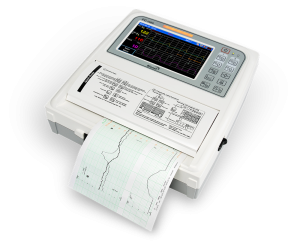 Built-in printer provides easy-to-read B4 size printout for charting. Onboard memory allows you to review and print up to 72 hours of internally stored data. USB flash drive interface provides a simple way to move the test result to PC for EMR attachment. LAN and WiFi interface make it easy to adapt to wired and wireless networking environments. Automatic fetal movement detection and TOCO zeroing reduce the intervention of the users. CTG (Cardiotocography) interpretation provides the silent recommendation for NST (Non-Stress Test).